When your back relaxes, life becomes more enjoyable! The Health Mark Pro Inversion Table provides the most support and comfort of any table in its class. With a transition bed constructed of 840 nylon denim, you can trust that your back will be fully supported in the correct alignment as you transition from horizontal to any chosen angle. Inversion Therapy has been proven to help decompress the spine, allowing for increased circulation along the spinal column and a reduction of muscle stress, fatigue and lower back pain; or utilize rhythmic traction to achieve total relaxation and increased mental alertness. Inversion Therapy is also useful in the temporary relief of varicose veins and lymphatic fluid accumulation in the lower extremities. There are areas in your life where it is wise save or conserve money. This is not the case when it comes to your health or your safety. When a company implements cost cutting measures during manufacturing of products, those measures will undoubtedly affect the structural integrity of the product, and transitively the safety of the user. The best and safest inversion tables on the market should never be determined by the lowest price tag or the heaviest construction weight. There are certain intangibles that must be considered. For example the nylon denim firmness and quality, the transitional bearings found only on the Health Mark tables, the tubular steel thickness, the stability of the frame as designated by the front split leg design, the ease of use provided by the short hook handlebars opposed to wrap-around handles which create back strain when used for transitioning, and the integrity of ankle locking mechanisms. 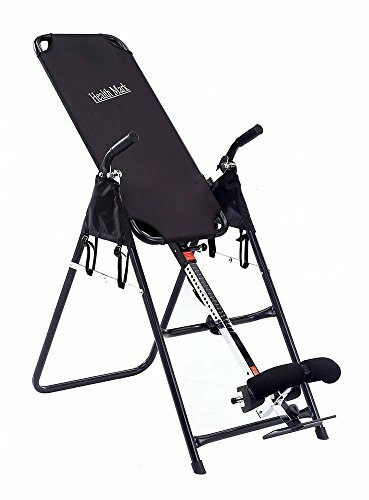 Ultimately the safety and effectiveness of any inversion table will not be determined by any aesthetic coloring, stitching or molding; nor by any accessory which may be sold with it. Ultra comfortable ankle bracket; firm and durable nylon bed. 300 lbs weight capacity. Can accommodate any person from 4' 8" up to 6' 6". If you have any questions about this product by Health Mark, contact us by completing and submitting the form below. If you are looking for a specif part number, please include it with your message.